I don’t eat a lot of meat but I’m not a vegetarian. However, I often find vegetarian or vegan options at restaurants to be very delicious and unique. 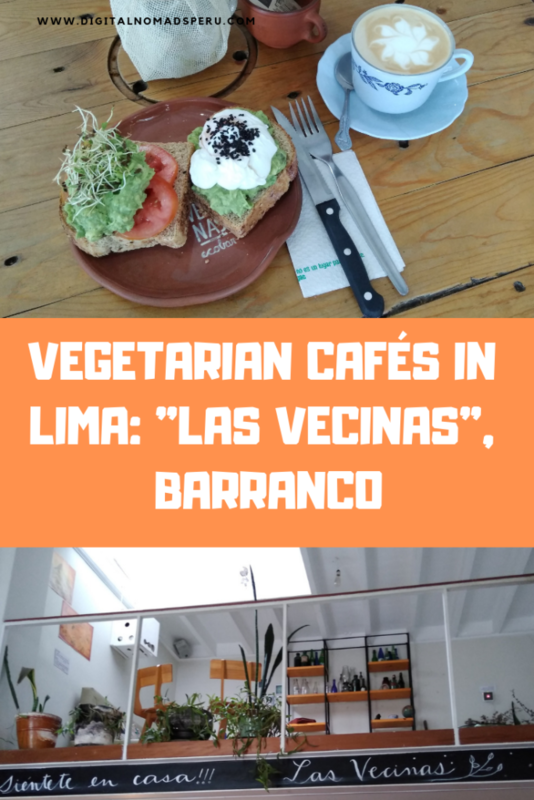 So with this post, I’m starting a series about vegetarian cafes in Lima. As I live in Barranco, it made sense to have a look at places nearby first. 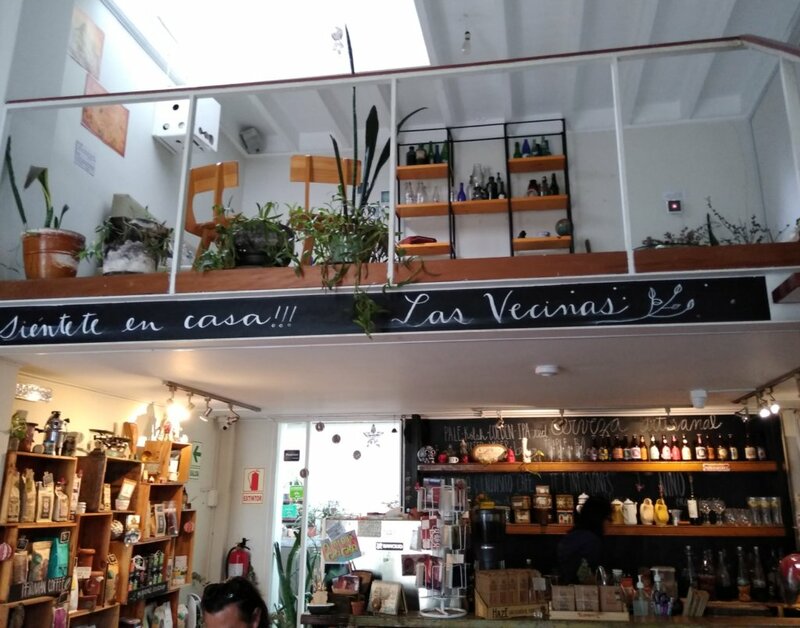 I discovered “Las Vecinas” when I searched for a place where I could have a quinoa breakfast I wanted to write about for a collaboration post. For me, it’s not only the food but I also like the places where I eat to be quiet, to have comfortable chairs and in general an inviting and beautiful atmosphere. When I entered “Las Vecinas”, I immediately knew that it wouldn’t be a one-time visit. “Las Vecinas” is Spanish for “The neighbours”. Female neighbours to be exact. No idea why they chose that name, I should really ask next time I go there. When I first visited, I spoke a bit to one of the waitresses who told me that they opened about 6 years ago. The owner is Peruvian but lived abroad for a long time. Makes sense because everything, including the website, is written in English and Spanish. The waitress also told me that many foreigners come to the place and that most of the employees speak at least a little English. Is it suitable for digital nomads? Good news! Yes, it is. They have good wi-fi (someone was even doing a Skype call while I was there) and it’s okay for them when you spend some time there to get work done. Just a quick reminder from my side: Be fair and order more than just a coffee if you plan to spend three hours there. They offer different types of breakfasts, sandwiches and salads, some pasta choices and some really great snacks (“piqueos” is the Spanish words which you will find on all menus). I especially recommend the guacamole and the potato dishes, very very yummy. Although guacamole is originally from Mexico, it’s very common in Peru, too and avocados can be bought everywhere. Just like in Chile, Argentina and Uruguay, they are called “palta” here. Well, and as far as potatoes are concerned … They originate from Peru and the variety is incredible. I mean, I’m German and we’re supposed to be huge potato eaters but what they have in Peru and what they do with potatoes is much more incredible. This guacamole is served with quinoa bread, another Peruvian speciality. Like everywhere, you can choose among a great variety of delicious and healthy juices. Peru is simply the country of the best juices. Just make sure to order your juice without sugar. Even in places such as “Las Vecinas”, they still have the tendency to add sugar to your juice. Okay, I’ll be fair, in most places they ask you now. 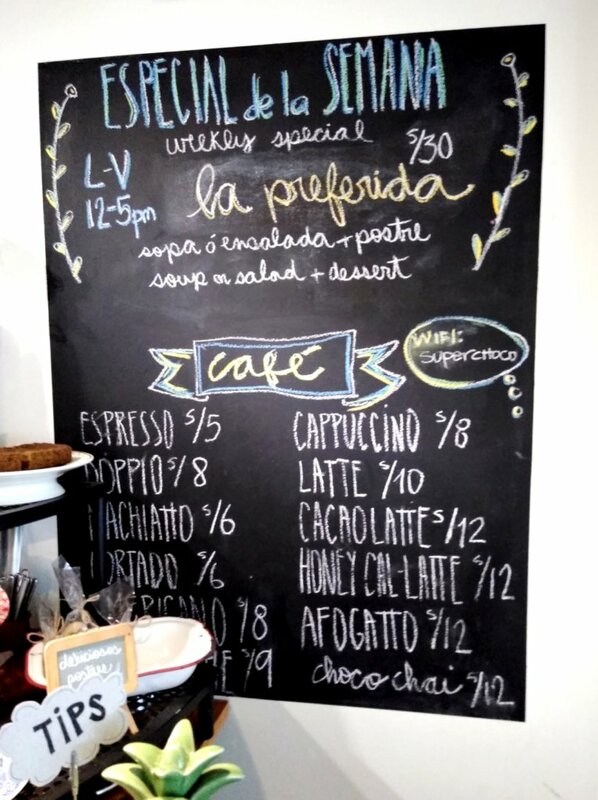 “Las Vecinas” also offers coffee, tea and hot chocolate, of course. I’m not totally sure but I think they mainly use organic products. The prices for everything you can drink are about the same like in all more or less fancy café and restaurants in Barranco. Personally, I’m always a bit surprised that a juice or even a coffee is relatively pricey compared to what you pay for your food. “Las Vecinas Café” consists of two rooms and a gallery. If you want to get some work done, the gallery is probably the best choice. On the other hand, if you like to watch people, stay in the room you first enter. The place is nicely decorated and I’ve never found it noisy. It may be different in the evenings, for me, “Las Vecinas” is great for having breakfast or lunch. I’ve never been there after 3 pm. As mentioned above, most of the staff speak at least a little English and I’ve found all of them to be very friendly. They react quickly when you need something or simply want to pay. Especially as a woman who often goes somewhere on her own, I find this worth mentioning because it has already happened to me more than once that I wanted to leave and it took ages to call a waiter, get the bill and finally pay. By the way, if this happens to you, just get up, pay at the counter and forget about the tip. I don’t come from a country with a huge tip culture and if I dislike the service (or the food), I show this by not tipping at all. Totally possible in Peru. I know that especially Americans and Canadians are constantly worried about tipping but that’s North American culture where waiters receive a very low basic salary and it’s common practice that tips are seen as part of the salary. Simply remember that tipping is not common in many parts of the world and certainly not 20%. I think that once I need to write a post about the reasons why I’m not a fan of tipping at all. 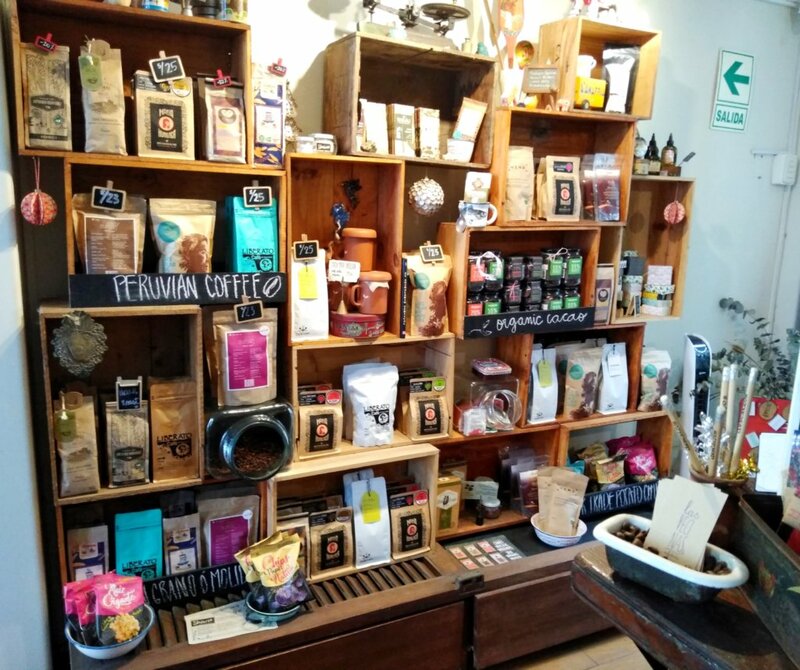 They also have a small shop at the restaurant where you can buy some original Peruvian products including coffee and cacao at very reasonable prices. Some of the products they sell at Las Vecinas. Did you like the post? Why not share it on Pinterest then? Huge thanks. For suggestions and questions, please don’t hesitate to write in the comments. 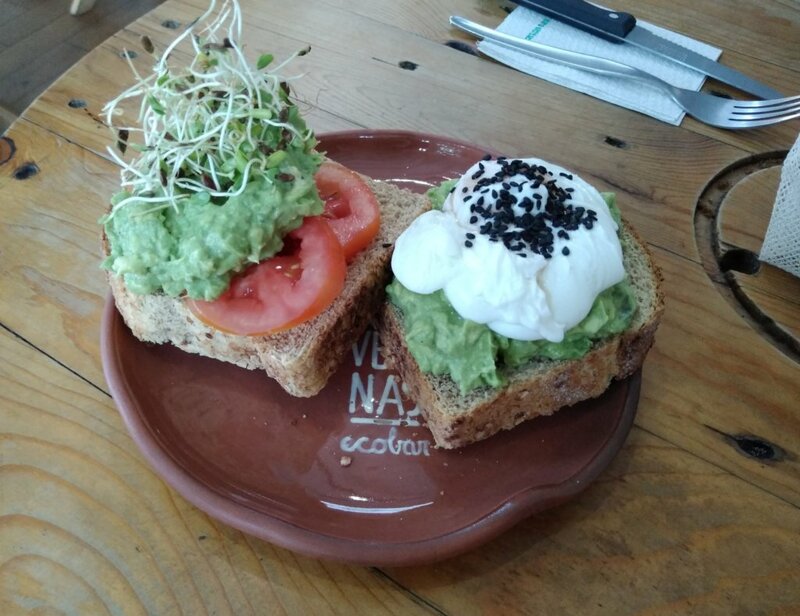 Las Vecinas sounds like a very cool, inviting and relaxing atmosphere with what looks to be refreshing vegetarian options. It also seem to be a cute little cozy place for one to eat, shop and work. Great feature and thanks for sharing. Thank you very much for your nice comment, Roslie. It’s a great place indeed.